I loved Robert Charles Wilson’s sci-fi Spin trilogy, about an earth which loses its night sky and what comes after those lights go out. 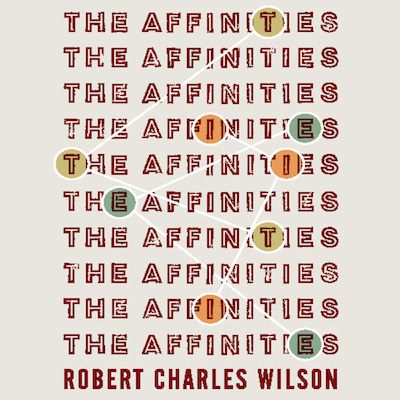 When I heard he had a new novel out called The Affinities, I was super eager to pick it up. The concept of The Affinities is a little bit Match.com, a little bit socialism. Adam Fisk is an early adopter of Affinity Testing. Thanks to the new field of socionomics, he’s led through a battery of tests which may qualify him for one of twelve Affinity Groups. This isn’t just a dating service, though, or a group of like-minded folks: affinity group members get each other from their first meeting, often live together, hire each other, and (eventually) care for their own much more than they do the rest of society. Lucky Adam tests into the elite Tau Affinity, and the book skips forward to a world brimming over with the potential of affinities able to work perfectly together, people finely tuned for trust and cooperation, but cooperation with only a slice of humanity. Tau is at war with Het, another prominent affinity, and Adam and his family are caught in the crossfire. As a lover of Wilson’s previous trilogy, this felt rushed to me. The glossing over of Adam’s nestling into the Tau Affinity, and the global shift as affinities rose from an early phenomena to an over-arching issue, felt like an introduction rather than the first half of a novel. And although other reviewers have noted the obvious parallels with social networking, I couldn’t help but think of the Divergent series and other sci-fi with social testing elements as I read. So, if you love Divergent (hey, no shame in that!) and are looking for a story that takes on some of its issues on a more plausible, understated level, this is your book. And if you haven’t checked out Spin yet, make sure to add it to your list.